NASA’s Cassini orbiter made its first dive into Saturn’s ring system on Sunday, Dec. 4. It’s the beginning of an endgame in which the spacecraft will fly across the ring plane and ultimately impact the giant planet on Sept. 15, 2017. 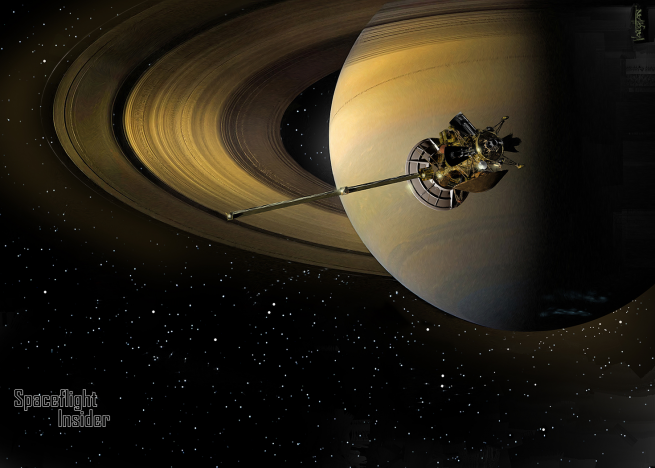 Cassini has been orbiting the Saturnian system, studying and imaging its rings and moons, since its arrival in 2004. Its numerous discoveries include methane lakes on Saturn’s largest moon, Titan, and an ocean that shows signs of hydrothermal activity on the moon Enceladus. During its nine-month journey through the ring system, the orbiter will capture close-up images of the rings’ outer regions and the planet’s many small moons. On Sunday, the spacecraft conducted a six-second main engine burn approximately an hour before crossing the outer edge of Saturn’s extensive ring system. The move occurred at 8:09 a.m. EST (13:09 GMT) and focused on maneuvering the engine accurately rather than obtaining photos and conducting science observations. To protect the spacecraft, its canopy-like engine was closed about 30 minutes before the dive. The dish of its high-gain antenna has been positioned in the direction that Cassini is traveling to shield the spacecraft and its instruments from potentially hazardous particles that are difficult to see when orbiting at a speed of thousands of miles per hour. Cassini crossed the ring plane from approximately 57,000 miles (91,000 kilometers) above the giant planet’s cloud tops, the site of a faint ring created by dust from the small moons Janus and Epimetheus, discovered by Cassini in 2006. This dim ring is only 6,800 miles (11,000 kilometers) from the middle of Saturn’s outermost and most active ring, the F Ring, discovered in 1979 by the imaging team of Pioneer 11. Within just a few hours of the dive, the spacecraft began scanning Saturn’s rings using its radio science experiment. Images of Saturn were taken two days before the dive, more for assuring accuracy than for scientific purposes. Now, the study of the rings’ structure begins in detail. The spacecraft will engage in a total of 20 separate ring-grazing orbits, each lasting one week. Sunday’s move was the first of these orbits. On Dec. 11, Cassini will make its second of the 20 moves, still in the rings’ outer edges. 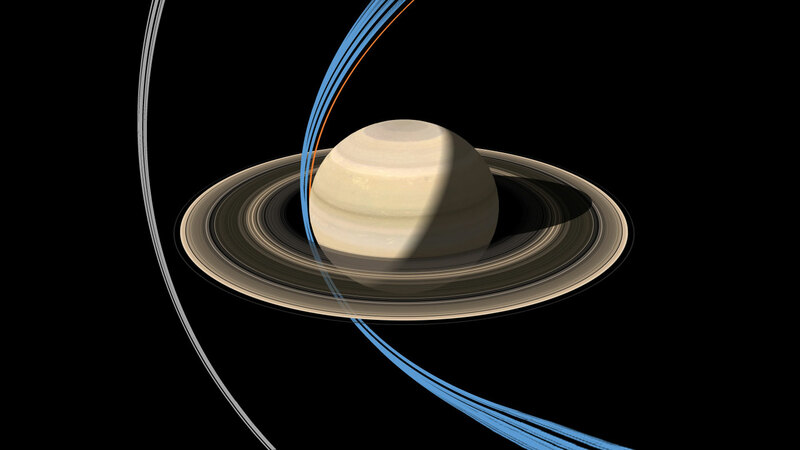 “It’s taken years of planning, but now that we’re finally here, the whole Cassini team is excited to begin studying the data that come from these ring-grazing orbits. This is a remarkable time in what’s already been a thrilling journey,” said Cassini project scientist Linda Spilker. This phase will conclude on April 22, 2017, when Cassini makes its 126th and last flyby of Titan. The spacecraft will use radar to study Titan’s surface, map the composition of its lakes and seas, measure the elevations of the small lakes, look for changes in the lakes and seas since previous observations, and use a mass spectrometer to study the large moon’s atmosphere. The Titan flyby will alter Cassini’s trajectory, putting it on course for 22 daring plunges through the 1,500-mile (2,400-kilometer) wide gap between the innermost ring and the planet four days later. In order to prevent Saturn’s moons from being contaminated by microbes that may reside on the orbiter, Cassini will end its mission next September by plunging into the planet’s atmosphere, where it will be destroyed, transmitting back data until the last possible moment.